After the owners of a London bakery were forced to ask customers to send fewer orders this week when their incredible Lego birthday cake went viral, we've been left daydreaming about the amazing design possibilities ahead of birthday season. From gravity-defying chocolate cakes, to giant doughnuts and miniature library cakes, there's very little that can't be done with a slab of royal icing (provided you've got the skills to pull it off) and some food colouring. 1. The cake that started it all, Cupcakes By SJ's Lego cake. 2. An actual aquarium cake with sugar glass - by Leith Christensen. 3. The best science project you'll ever eat - by Cake Crumbs. 4. A super detailed Little Mermaid cake - by Cake Central. 5. A mini library, comeplete with tiny books - by Kathy Knaus. 6. Knitting cake for wool lovers from Cake Central. 7. Harry Potter cake, complete with a golden snitch - by Tier Luxury Cakes. 8. We kind of feel a little sick looking at this sugary fry up cake - by Paul's Creative Cakes. 9. Probably the best baby shower cake design of all time - by Nice Icing. 10. 'The Big Eat' cake, which won the Cake International Award in 2014, described by the baker as: "the heaviest food cake I have ever made!" - by Laura Loukaides. 11. The in-house chef at North Devon District Hospital created this sewing box cake for the NHS cake competition. She won, obviously. 12. This is by far the most incredible Up cake you will ever see - by someone amazing, but unknown. 13. An edible metallic boombox cake for music lovers - by Mark. 14. For lovers of baked beans - by Paul's Creative Cakes. 15. Gravity-defying noodle cake - by Lauren Kitchens. 16. A gravity-defying ice cream sundae cake - by Rose And Bows. 17. A sandwich wedding cake for a groom - by someone amazing in Dallas. 18. Pink Floyd cake, complete with rainbow centre - by A State Of Joy. 19. Beemo from Adventure Time - by Ttilda. 20. A new take on the Lego cake - by someone's mum for a Lego birthday party. 21. When someone says they're on a diet, you get them this vegetable cake - by someone's awesome wife. 22. A giant doughnut birthday cake - by Coco Rose. 23. A cake in the shape of a tree, because, well, why not? By Milk And Cereal. 24. An ice cream sundae cake - by Paul's Creative Cakes. 25. You've seen the Kit-Kat cake, now you can make a pigs in mud version - by Cake Baker. 26. Probably the most unhealthy packed lunch you will ever consume - by Paul's Creative Cakes. 27. 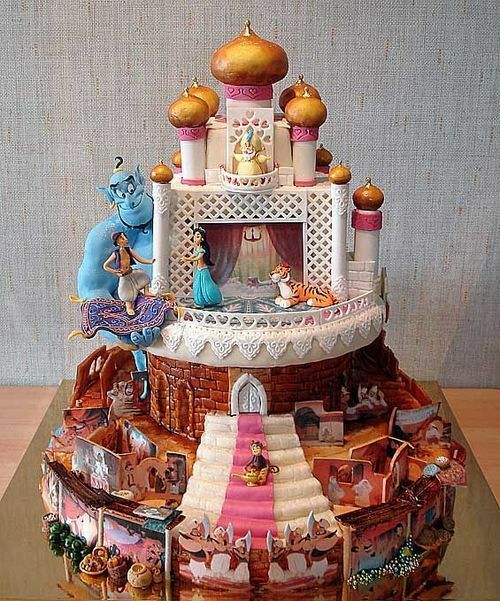 Aladdin cake by someone amazing, but we don't know who.